در این تحقیق رفتار ضربه ثقلی نوع جدیدی از هسته‌های سه بعدی بافته شده به روش بافندگی حلقوی پودی بررسی شده است. هسته‌های سه بعدی بافته شده به روش بافندگی حلقوی پودی و بوسیله یک ماشین تخت باف با دو سطح مقطع هندسی مثلثی و مستطیلی بافته شدند. کامپوزیتهای ساندویچی از این هسته‌های سه بعدی به روش تزریق رزین به کمک کیسه خلا تولید شدند. نتایج نیروی تماس ضربه ثقلی در سه سطح انرژی مختلف برروی نمونه‌های کامپوزیت ساندویچی سه بعدی با سطح مقطع مستطیل و مثلث نشان داد که استحکام نمونه با سطح مقطع مثلثی در مقایسه با نمونه با سطح مقطع مستطیلی در تمام سطوح انرژی ضربه ثقلی بیشتر بوده است. همچنین با افزایش سطح انرژی ضربه ثقلی نیروی تماس ضربه برای تمام نمونه‌ها افزایش داشته است. آسیب وارد شده به نمونه‌ها شامل ترک‌های عرضی ایجاد شده در پوسته و ترک در لایه‌های اتصال در هسته بود. همچنین با افزایش سطح انرژی ترک در پوسته زیرین و تورفتگی در نقطه مورد اصابت ضربه مشاهده شد. هیچگونه تورق میان پوسته و هسته در کامپوزیت‌های ساندویچی سه بعدی حلقوی پودی مشاهده نشد. In this study the behavior of a novel 3D integrated weft knitted sandwich composite (3DIWKSCs) were investigated. The weft knitted spacer fabrics produced by E-glass fibers on a flat knitted machine with tow cross-sectional shapes (rectangular and triangular). The 3DIWKSCs manufactured by use of the vacuum assisted resin transfer molding (VARTM). The results of the 3DIWKSCs with tow cross-sectional shapes under drop-weight impact tests in three energy levels showed that the triangular-shape of 3DIWKSC has the higher strength in all energy levels of impact than the rectangular-shape of 3DIWKSC. Furthermore the contact force of 3DIWKSCs was increased by increasing of the energy level of impacts. The main damage modes of 3DIWKSCs under impacts were the transverse cracks on the upper face-sheets and the cracks on the connecting layers of the core. Also, by increasing the energy level, cracks occurred in the lower face-sheets as the curved area and the local indentation were created underneath the impactor. There is no any de-bonding between the core-face of the 3DIWKSCs under drop-weight impact tests. Peters, S.T., “Handbook of composites”, Second Edition, Chapman & Hall, Chap.12, pp.254-290, 1998. 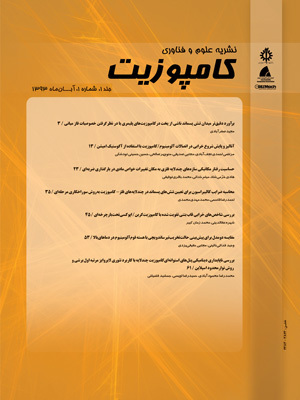 Azarafza, R., Davar, A., Mahmoodi, A., “Three-point bending test of metal and composite sandwich panels with grid stiffened core” In Persian, Journal of Science and Technology of Composites, Vol.3, No. 4, pp. 377-388, 2017. Herup, E.J., Palazotto A.N., “Low-Velocity Impact Damage initiation in GRAPHITE/EPOXY/NOMEX HONEYCOMB-sandwich plates” Composites Science and Technology, Vol. 57, No. 1, pp.1581-1598, 1997. He, W., Liu, J., Tao, B., Xie, D., Liu, J., Zhang M., “Experimental and numerical research on the low velocity impact behavior of hybrid corrugated core sandwich structures” Composite Structures, Vol.158, No. 1, pp. 30–43, 2016. Vaidya, U. K., Pillay, S., Bartus, S., Ulven, C. A., Grow, D. T., Mathew B., “Impact and post-impact vibration response of protective metal foam composite sandwich plates” Materials Science and Engineering A, Vol. 428,No. 2, pp. 59–66, 2006. Malekzadeh Fard, K., Khalili, S.M.R, Forooghy, S.H., Hosseini, M., “Low velocity transverse impact response of a composite sandwich plate subjected to a rigid blunted cylindrical impactor” Composites: Part B, Vol. 63, No. 1, pp. 111–122, 2014. Ma, P., Zhang, F., Gao, Z., Jiang, G., Zhu, Y., “Transverse impact behaviors of glass warp-knitted fabric/foam sandwich composites through carbon nanotubes incorporation” Composites: Part B, Vol. 56, No. 1, pp. 847–856, 2014. Park, J.H., Ha, S.K., Kang, K.W., Kim, C.W., Kim, H.S., “Impact damage resistance of sandwich structure subjected to low velocity impact” Journal of Materials Processing Technology, Vol. 2 0 1, No. 1, pp.425–430, 2008. Imielin´ska, K., Guillaumat, L., Wojtyra, R., Castaings, M., “Effects of manufacturing and face/core bonding on impact damage in glass/polyester–PVC foam core sandwich panels” Composites: Part B, Vol. 39, No. 1, pp.1034–1041, 2008. He, Y., Tian, G.Y., Pan, M., Chen, D., “Non-destructive testing of low-energy impact in CFRP laminates and interior defects in honeycomb sandwich using scanning pulsed eddy current” Composites: Part B, Vol. 59, No. 1, pp.196–203, 2014. Tong, L., Mouritz, A.P. and Bannister, M.K., “3D Fiber Reinforced Polymer Composites” Elsevier, 2002. Palazotto, A.N., Gummadi, L.N.B., Vaidya, U.K., Herup, E.J., “Low velocity impact damage characteristics of Z-fiber reinforced sandwich panels - an experimental study” Composite Structures, Vol. 43, No. 1, pp.275-288, 1999. Fan, X., Xiao-Qing, W., “Study on impact properties of through-thickness stitched foam sandwich composites” Composite Structures, Vol.92, No. 1, pp.412–421, 2010. Baral, N., Cartié, D.D.R., Partridge, I.K., Baley, C., Davies, P., “Improved impact performance of marine sandwich panels using through-thickness reinforcement: Experimental results” Composites: Part B, DOI: 10.1016/j.compositesb.2009.12.002. Seltzer, R., González, C., Muñoz, R., Lorca, J., Blanco-Varela, T., “X-ray microtomography analysis of the damage micromechanisms in 3D woven composites under low-velocity impact” Composites: Part A, Vol.45, No. 1, pp.49-60, 2013. Hosur, M.V., Karim, M.R., Jeelani, S., “Experimental investigations on the response of stitched/unstitched woven S2-glass/SC15 epoxy composites under single and repeated low velocity impact loading” Composite Structures, Vol.61, No. 1, pp.89-102, 2003. Hu, H., Sun, B., Sun, H., Gu, B., “A Comparative Study of the Impact Response of 3D Textile Composites and Aluminum Plates” Journal of Composite Materials, Vol.44, No. 1, pp.593, 2010. Hosur, M.V., Abraham, A., Jeelani, S. and Vaidya, U.K., “Studies on the Influence of Through-the-Thickness Reinforcement on Low-Velocity and High Strain Rate Response of Woven S2-Glass/Vinyl Ester Composites” Journal of Composite Materials, Vol.35, No. 1, pp.1111, 2001. Zhang, D., Sun, Y., Chen, L., Pan N., “A comparative study on low-velocity impact response of fabric composite laminates” Materials and Design, Vol.50, No. 1, pp.750-756, 2013. Hosur, M.V., Abdullah, M., Jeelani, S., “Manufacturing and low-velocity impact characterization of hollow integrated core sandwich composites with hybrid face sheets” Composite Structures, Vol.65, No. 1, pp.103-115, 2004. Vaidya, U.K., Hosur, M.V., Earl, D., Jeelani, S., “Impact response of integrated hollow core sandwich composite panels” Composites: Part A, Vol.31, No. 1, pp.761-772, 2000. Karahan, M., H. Ivens, G.J. and Karahan, N., “Low velocity impact characteristics of 3D integrated core sandwich composites” Textile Research Journal, Vol.82, No. 1, pp.945, 2012. Herb, V., Martin, E., Couégnat, G., “Damage analysis of thin 3D-woven SiC/SiC composite under low velocity impact loading” Composites: Part A, Vol.43, No. 1, pp.247–253, 2012. Abounaim, M., Hoffmann, G., Diestel, O., Cherif, C., “Thermoplastic composite from innovative at knitted 3D multi-layer spacer fabric using hybrid yarn and the study of 2D mechanical properties” Composites Science and Technology, Vol.70, No.2, pp.363-370, 2010. Abounaim, M., Hoffmann, G., Diestel, O., Cherif, C., “Development of Flat Knitted Spacer Fabrics for Composites using Hybrid Yarns and Investigation of Two-dimensional Mechanical Properties” Textile Research Journal, Vol.79, No.7, pp.596, 2009. Abounaim, M., Diestel, O., Hoffmann, G., Cherif, C., “Thermoplastic composites from curvilinear 3D multi-layer spacer fabrics” Journal of Reinforced Plastics and Composites, Vol.0731, pp.6844, 2010. Hamedi, S., Hasani, H. and Dibajian, S. H., “Numerical simulating the flexural properties of 3D weft-knitted spacer fabric reinforced composites” J Compos Mater, Vol.13, No. 1, pp.1887–1899, 2017. Azadian, M., Hasani, H. and Shokrieh, M.M., “Flexural behavior of composites reinforced with innovative 3D integrated weft-knitted spacer fabrics” DOI: 10.1177/1528083717721923., 2017.